Formation of gas in the digestive track is normal and passing the occasional bit of air is a natural bodily function. But problem arises when a lot of gas gets accumulated in the digestive system and causes undesirable belching and flatulence. Specific dietary choices, chewing food improperly, stress, bacterial infection and food allergies are some of the reasons for excessive gas. Although, gas is an embarrassing problem but it can be treated successfully with various self-treatment methods using natural ingredients. One such ingredient is baking soda or sodium bicarbonate which is more effective and safe than commercial antacids. Is Baking Soda Good For Gas? Baking soda reacts with the stomach acids to produce carbon dioxide that initiates belching and leads to expulsion of excess gas from the stomach. One of the most common causes of gas is indigestion. Baking soda helps to cure indigestion by breaking down the fats present in food thus making it easier to digest. It functions as an antacid that helps to neutralize the stomach acids and relieve gas and bloating caused by acid reflux. It develops an alkaline pH when dissolved with water and this alkalinity of baking soda helps to treat various digestion issues. Baking soda can be used in a number of ways to relieve gas and flatulence. You can simple simply mix 1/2 tsp of baking soda with 4 oz of water form a natural antacid. Alternatively, combine baking soda with other ingredients such as lemon juice, vinegar, mint, etc. to prepare an effective remedy for gas. 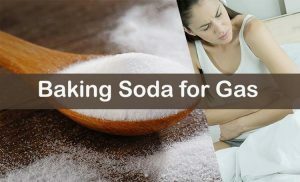 Consuming plain baking soda with water creates carbonation in the intestine and relieves gas and bloating efficiently. Add 1/2 teaspoon of baking soda to 4 ounces of water. Stir it using a spoon so that baking soda dissolves properly. Drink this solution to get instant relief from bloating and gas. You can also use lukewarm water for this remedy. Note – Don’t drink baking soda – water solution on a full stomach. The acidic nature of lemon juice accelerates digestion and emptying of the stomach which in turn helps to relieve the bloated feeling that comes with gas. Add 3 tablespoons of fresh lemon juice and 1/2 teaspoon of baking soda to 1/2 glass of water. Give it a good stir so that the baking soda dissolves in the water. Drink this concoction to get rid of the trapped gases and promote digestion. Note: You can add a pinch of salt to the concoction for added benefits. Apple cider vinegar helps to relieve gas and bloating caused by indigestion. The enzymes in apple cider vinegar aids digestion and prevent constipation which is the primary cause of gas. Add a teaspoon of baking soda and 2 tablespoons of apple cider vinegar to a glass of water. Give it a stir to mix all the ingredients. Drink this concoction 2 to 3 times a day to relieve gas and flatulence. The essential oils in peppermint leaves contain menthol that soothes the churning muscles of the stomach and relieves gas and bloating by relaxing the smooth muscles of the digestive track. Steep a bag of herbal peppermint tea in a cup of boiling water. Remove the tea bag and add a teaspoon of baking soda to the tea. Stir it with a spoon and drink it up after a meal. Mix the ingredients well until baking soda gets dissolved. Antispasmodic and anti-inflammatory effects of chamomile relax the muscles of the abdomen and help to relieve gas caused by indigestion and heartburn. Add a teaspoon of dried chamomile in a cup of boiling water. Strain it and add a teaspoon of baking soda to it. Mix it with a spoon and drink it slowly. The chemical components gingerols and shagaols present in ginger relax the intestinal track, soothe inflammation and aids digestion. It also acts as a carminative which relieves and prevents the formation of excess gas. Grate a 2-inch fresh ginger root and add it a glass of boiling water. Let the ginger steep for 10 minutes and then add a teaspoon of baking soda to it. Drink it up before or after a meal to help relieve gas and bloating. The heating quality present in garlic stimulates the gastric fire in the stomach and helps to release trapped gas and provide relief from bloating. Crush 3 to 4 cloves of fresh garlic and boil it in a cup of water for 5 minutes. Add a dash of black pepper and a teaspoon of baking soda into it and drink this tea. You can drink it 2 to 3 times in a day depending on the severity of your bloating. Fennel Seeds are known from their anti-spasmodic properties that help to relax the muscles of the stomach. It also acts as a carminative that stimulates the body to expel excessive gas from the intestinal track. Add a tablespoon of fennel seeds in a glass of water and let it steep overnight. Strain the water the next morning and add a teaspoon of baking soda to it. Drink it up to soothe gas and bloating. You can also chew up some of the soaked fennel seeds. Black pepper promotes the release of hydrochloric acid in the stomach which helps to treat indigestion and there by relieve gas. Add a teaspoon each of black pepper powder, baking soda and coriander seed powder to a cup of warm water. Using a spoon stir it well. Drink this concoction 2 times in a day to cure bloating and gas. Carmon seeds or Ajwain contains high level of thymol, a chemical that triggers the release of gastric juices which speed up the process of digestion and helps to relieve flatulence and gas. Boil a tablespoon of carom seeds in 2 cups of water till the water is reduced to half. Now strain the drink and let it cool a bit. Add a teaspoon of baking soda to it and drink it slowly. Avoid taking baking soda along with antacids. Excessive consumption of baking soda can upset the acid-base balance of the body and cause nausea, diarrhea, stomach cramps, etc. Baking soda is high in sodium and so high doses can raise blood pressure, cause swelling and in severe cases it can overload circulation and lead to heart failure. People suffering from edema, liver disease, kidney disease or hypertension should not consume baking soda. Pregnant and breast-feeding women and children under the age of 5 years should also refrain from consuming baking soda. Do not use any baking soda remedy for treating digestive disorders for more than 2 weeks. Consult a doctor if your problem persists after 2 weeks. It is always recommended to consume baking soda in diluted form mixed with water. People on a sodium-restricted diet should consult their physicians before consuming baking soda. Baking soda may interact with certain medicines such as aspirin, calcium supplements, corticosteroids, etc. Avoid foods that cause indigestion and gas. It includes fried foods, processed foods, and foods containing lot of sugar. Include probiotics in your diet to promote digestive health and prevent gastrointestinal issues. Follow a healthy diet and plan out 4 to 6 small meals instead of 3 big ones to facilitate digestion and avoid gas and bloating. Try any remedy as per you convenience to get relief from gas. Don’t forget to share your tips and suggestions with us in the comments section below. The best way to use baking soda for gas is to mix 1/2 teaspoon with 4 oz. of lukewarm water. Stir until dissolved and drink the solution for immediate relief from gas and bloating. Never drink this on a full stomach. Still, this is not the only way to fix your gas problem using baking soda; try any of the 10 solutions in this article to discover what works best for you. All of the suggestions above refer to a “glass” of water…does that mean 8 oz or 16 oz? I would think a “cup” of water would mean 8 oz but I would prefer to know specifically so as not to dilute the remedy. In the article a glass of water refers to 8oz of water. Baking soda is not acidic, it is a base substance. Its pH is higher than 7.0 so it neutralizes the stomach acid reducing the acidity. “Don’t use the baking soda methods for more than two weeks?” What’s the alternative? A lifetime of powerful antacids prescribed by a doctor? I think baking soda is a good deal safer than proton pump inhibitors. Baking soda should not be used more than 2 weeks because it can cause damage to the stomach lining or eusophagus lining. Instead you can try different ingredients fennel seeds, ginger, apple cider vinegar and many others. You can find more remedies in this article – http://homeremediesforlife.com/stomach-gas/. Avoid taking baking soda after eating dinner. What is a different between baking powder and baking soda? Baking soda is single ingredient: Sodium bicarbonate which is base by nature. But baking powder contains baking soda and other two ingredients: a powdered acid and cornstarch. Will this baking soda mixes help with my belching and nausea? Yes, it helps. Baking soda reacts with the stomach acids to produce carbon dioxide that initiates belching and leads to expulsion of excess gas from the stomach. How often can you take it if the first cup doesn’t work? You can take another dose after 4 – 5 hours. Don’t repeat the remedy more than 3 times in a day. If the remedies are not working, consult a doctor. Is baking powder just as good for getting rid of acid in the stomach and acid reflux as baking soda? That’s all I have in my cabinet right now and I don’t feel like going to the store LOL. Can baking soda reduce fat belly? How long after eating can you do the baking soda and water? You can take baking soda 3 hours after having meals. Avoid consuming it on full stomach. Very helpful and informative ! Don’t ever use Cayenne pepper or any other hot peppers, including black and white pepper (or chili) when constipated and with gas. In fact, eliminate them all from your cooking. They will destroy your stomach and intestines. BTW, Antiacids are not the answer! Baking Soda in water, lemon juice or apple cider vinegar may work to an extent, but I advise you to consult your gastrointestinal physician before self-medicating. I know this from experience. Why when I belch can I taste/smell (indigested) food that I ate six to eight hours earlier? Shouldn’t my stomach be emptying sooner? What can I do to speed up the emptying process?